The Prestige Cascade can combine 2 to 5 Prestige 399 boilers for outputs from 112 to 1995 MBH, or 2 Prestige 250 boilers for outputs from 65 to 490 MBH. 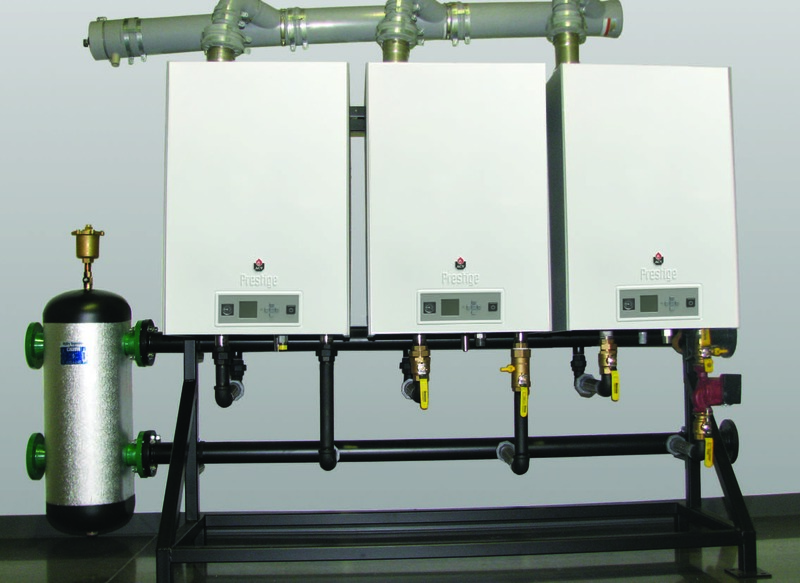 The boilers' integrated Cascade Control minimizes setup time. With a maximum turndown ratio of 18 to 1, the Cascade provides ample output during peak demands, yet adjusts its output during lower demands to minimize boiler cycling and maximize efficiency. The Common Vent for the Cascade Systems using Prestige 399 boilers allows either 2 or 3 boilers to be joined to a common vent, reducing venting space, installation time, and cost. The polypropylene venting meets ULC S636 requirements and is designed to optimize the system performance. A single wall penetration would be required for either the 2 or 3 boiler models. Several termination and flashing options are available.